Are you previewing a specific quote? The second payment days rule update on the property will set the rule for all new quotes, but that doesn't change existing ones. Or if you don't have any quotes yet, the system will use an example value. To change the test quote, go to the Rules tab of the quote and change it there -- that'll show you what I mean. Or create a brand new quote and it'll use the new settings. Aha! So what has happened here is that the season has a 30 day before arrival second payment days setting on it that is overriding the main one on the property. Looks like this and a few other seasons have the 30 days before arrival. Do you want that at all? If not let me know and I'll clear it off all of the seasons. Yep, it's rarely used -- mainly for things like high season payments are 60 days out but low season are 30 days out, etc. But sometimes people see it on the season and enter the value instead of (or in addition to) on the property. Went ahead and cleared all of those off of the season. 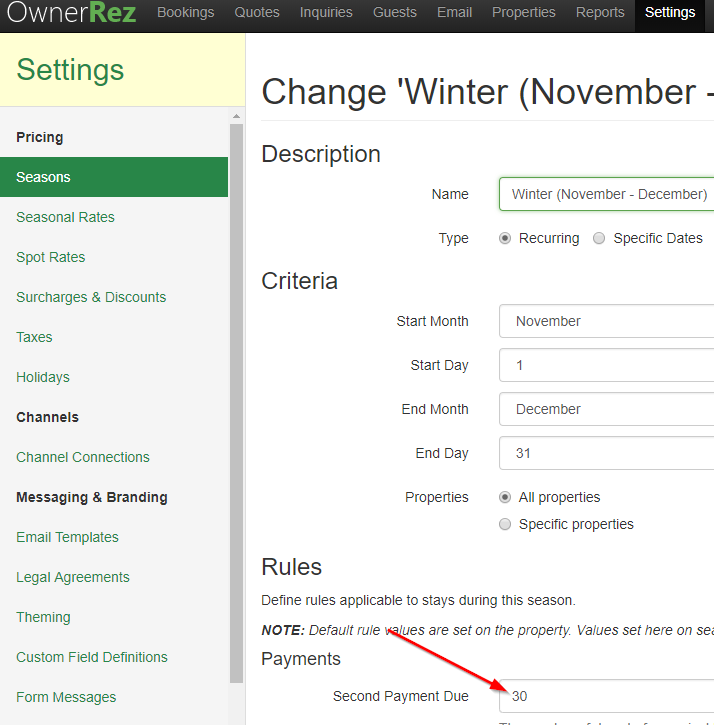 Create a new quote (or go to the Rules tab of your test quote and reset to property rules) and you'll be good to go.